As many as 70 more identified victims of the Srebrenica genocide will be buried on July 11 to mark the 22nd anniversary of Europe’s worst massacre since the World War II. 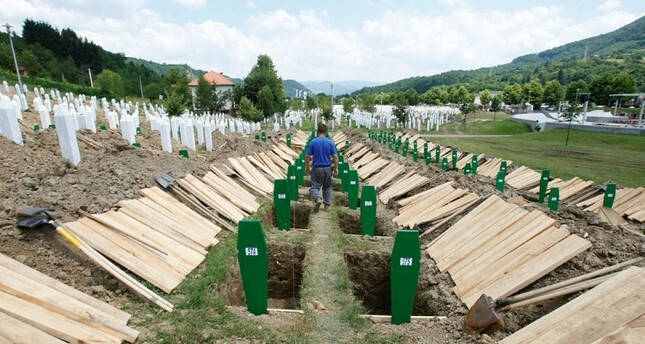 The victims’ bodies were exhumed from mass graves in eastern Bosnia and Herzegovina’s village of Potocari, 6 kilometers (4 miles) northwest of Srebrenica town, the Missing Persons Institute (MPI) of Bosnia and Herzegovina said in a statement. MPI is an independent state-level institution, whose mandate is to search for missing persons from the armed conflict relevant to Bosnia and Herzegovina and the Region. Seven of the victims to be buried this year were killed when they were below 18 years of age. Damir Suljic, who was 15-year-old when he was killed, is the youngest victim to be buried this year, while Alija Salihovic, the oldest one, was 72 years old. The statement by the institute said that no more than 70 victims were identified for this year’s anniversary. However, if the families of the previously identified victims had allowed the institute to complete the process, there would have been an increase in the number of victims to be buried this year. Most of the bodies exhumed from mass graves after years of search and excavation work are incomplete. Therefore, some families are waiting for more body parts to be found before burying their victims. About 8,000 Bosnian Muslim men and boys were killed after the Bosnian Serb army attacked the UN “safe area” of Srebrenica in July 1995, despite the presence of Dutch troops tasked with acting as international peacekeepers. In July 2014, a Dutch court ordered the Netherlands to compensate the families of more than 300 Srebrenica victims, saying the peacekeepers should have known they would be killed.